LFG Foundation and Football Camps are operated entirely by volunteers, from the Board of Directors to the college coaches and athletic trainers who donate and share their time and talent. We believe that every person has something to contribute. Whether you attend camp as a player, volunteer, coach or just to observe, we invite you to be part of a circle of strength and hope that is vital to the foundation’s success. For more information about volunteering at our PA football camp, please email Dawn Camp at compd@lafayette.edu. In addition to camp volunteers, LFG welcomes any experienced grant writers who wish to offer their time and services to support the foundation’s mission. 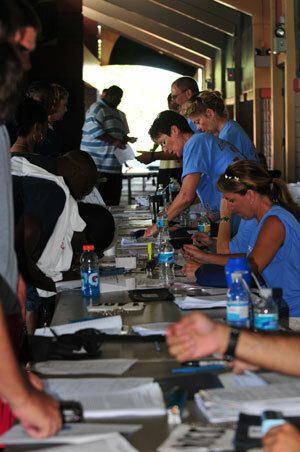 Volunteers register campers at the 2009 LFG Football Camp in Florida.